Sahib and the Crew Save the World: IRS to Pastors: You Can't Preach That! 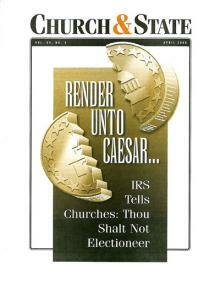 IRS to Pastors: You Can't Preach That! I know it will come as a shock to our devoted SACSTW readers, but once in a while there is an important issue to this country of which I am totally ignorant. It doesn't happen often, but this was one that had slipped by my notice. Having attended quite a variety of churches over my 47 years, I had noticed that in most cases, pastors rarely get very political from the pulpit. I erroneously thought that this was by convention and that in general pastors were just concerning themselves with spiritual as opposed to earthly matters. Hmmmm... To me that sounds like a violation of a couple of sections of the first amendment. Just the minor ones about free speech and freedom of religion. Where are all the separation of church and state apologists on this one? Isn't this one of the holy tenets of the left? Oh, that's right. We can't have any mention of Christianity in the government, but there's no problem with the government telling churches what they can and can't do or even more disturbingly what they can and can't say. "More than 1,000 pastors are planning to challenge the IRS next month by deliberately preaching politics ahead of the presidential election." “Hitler and Stalin, at their better moments, would just barely tolerate some churches remaining open, but would not tolerate any competition with the state in education, social services, and health care,” he said. “In clear violation of our First Amendment rights, Barack Obama – with his radical, pro-abortion and extreme secularist agenda, now seems intent on following a similar path,” the homily says. “This fall, every practicing Catholic must vote, and must vote their Catholic consciences, or by the following fall our Catholic schools, our Catholic hospitals, our Catholic Newman centers, all of our public ministries – only excepting our church buildings – could easily be shut down. I'd like to buy that guy a beer. Like the pastors and priests who will be defying the federal government on October 7, I REALLY hope the IRS takes action against them. I would love to see this in front of the Supreme Court. Of course, that is only if Chief Justice John Roberts has been taking his meds. Have a happy Thursday everyone! Clinton had "Is", Obama has "Spontaneous"
9/11 Cross: Dear Atheists, Quit Whining! Pass me that Plastic Carrot!